2013 Mack Model CXU613 Tandem Axle Truck Tractor, VIN# 1M1AW07YXDM034072, Mack MP8-445E Turbo Diesel Engine (445 HP), Mack Maxitorque 13-Speed Transmission, 42″ Flat Top Sleeper, Power Steering, Air Brakes, Engine Brake, 394,589 Miles, Heated & Remote Power Mirrors, Air Conditioning & Heat, Air Ride Seat, AM/FM/CD, Air Slide 5th, Power Windows & Locks, Flip Hood, 50,000lb. GVW, Twin Screw Rear Ends, Air Ride Suspension with Dump Valve, PTO with Wet Kit, 11R22.5 Radial Tires (Excellent), Polished Aluminum Wheels (All), (2) 75-Gallon Aluminum Fuel Tanks, (1) Upright Exhaust, Chrome Visor (Unit 125). 2013 Mack Model CXU613 Tandem Axle Truck Tractor, VIN# 1M1AW07Y8DM034071, Mack MP8-445E Turbo Diesel Engine (445 HP), Mack Maxitorque 13-Speed Transmission, 42″ Flat Top Sleeper, Power Steering, Air Brakes, Engine Brake, 420,714 Miles, Heated & Remote Power Mirrors, Air Conditioning & Heat, Air Ride Seat, AM/FM/CD, Air Slide 5th, Power Windows & Locks, Flip Hood, 50,000lb. GVW, Twin Screw Rear Ends, Air Ride Suspension with Dump Valve, PTO with Wet Kit, 11R22.5 Radial Tires (Excellent), Polished Aluminum Wheels (All), (2) 75-Gallon Aluminum Fuel Tanks, (1) Upright Exhaust, Chrome Visor (Unit 124). 2013 Mack Model CXU613 Tandem Axle Conventional Day Cab Truck Tractor, VIN# 1M1AW07Y9DM026948, Mack MP8-445E Turbo Diesel Engine (445 HP), Eaton Fuller 10-Speed Transmission, Power Steering, Air Brakes, Engine Brake, 384,598 Miles, Heated & Remote Power Mirrors, Air Conditioning & Heat, Air Ride Seat, AM/FM/CD, Air Slide 5th, Power Windows & Locks, Flip Hood, 50,000lb. GVW, Twin Screw Rear Ends, Air Ride Suspension with Dump Valve, PTO, 11R22.5 Radial Tires (Excellent), Polished Aluminum Wheels (All), (2) 70-Gallon Aluminum Fuel Tanks, (1) Upright Exhaust, Chrome Visor (Unit 126). 2009 Mack Model CHU613 Tandem Axle Conventional Day Cab Truck Tractor, VIN# 1M2AN07C19N004401, Mack MP8-445E Turbo Diesel Engine (445 HP), Mack Maxitorque 18-Speed Transmission, Power Steering, Air Brakes, Engine Brake, 174,967 Miles, 10,542 Hours, Heated & Remote Power Mirrors, Air Conditioning & Heat, Air Ride Seat, AM/FM/CD, Air Slide 5th, Power Windows & Locks, Flip Hood, 50,000lb. GVW, Twin Screw Rear Ends, Air Ride Suspension with Dump Valve, PTO, 11R22.5 Radial Tires (Excellent), Polished Aluminum Wheels (All), (2) 70-Gallon Aluminum Fuel Tanks, (1) Upright Exhaust, Chrome Visor (Unit 641). 2009 Mack Model CHU613 Tandem Axle Conventional Day Cab Truck Tractor, VIN# 1M1AW07Y89N006885, Mack MP8-445E Turbo Diesel Engine (445 HP), Mack Maxitorque 18-Speed Transmission, Power Steering, Air Brakes, Engine Brake, 510,281 Miles, 19,845 Hours, Heated & Remote Power Mirrors, Air Conditioning & Heat, Air Ride Seat, AM/FM/CD, Air Slide 5th, Power Windows & Locks, Flip Hood, 50,000lb. GVW, Twin Screw Rear Ends, Air Ride Suspension with Dump Valve, PTO with Wet Kit, 11R22.5 Radial Tires (Excellent), Polished Aluminum Wheels (All), (2) 70-Gallon Aluminum Fuel Tanks, (1) Upright Exhaust, Chrome Visor (Unit 122). 2004 Mack Model CX613 Tandem Axle Day Cab Truck Tractor, VIN# 1M1AE06Y54N0202086, Mack AC-335/380 6-Cylinder Turbo Diesel Engine, Eaton Fuller 10-Speed Transmission, 456,330 Miles, 20,154 Hours, Air Brakes, Power Steering, Air Conditioning & Heat, Engine Brake, Cruise Control, Heated & Remote Power Mirrors, AM/FM/Cassette, Flip Hood, 52,000lb. GVW, Twin Screw Rear Ends, Air Ride Suspension with Dump Valve, 11R22.5 Radial Tires, Polished Aluminum Wheels (All 10). 2001 Mack CX613 Tandem Axle Truck Tractor, VIN# 1M1AE06Y11W009680, Mack Maxitorque E7365-380 Turbo Diesel Engine (355 HP), Eaton Fuller 10-Speed Transmission, 42″ Sleeper, 579,868 Miles, 22,259 Hours, Air Brakes, Power Steering, Engine Brake, Cruise Control, Tilt & Cruise, Air Conditioning & Heat, Flip Hood, Air Ride Seat, 52,000lb. GVW, (2) 100-Gallon Aluminum Step Fuel Tanks, PTO with Wet Kit, Upright Exhaust, 11R22.5 Radial Tires, Polished Aluminum Wheels (All), Fenders (Unit119). 2009 Mack Model CHU613 Triple Axle Dump Truck, VIN# 1M2AN07CX9N004400, Mack Model MP8-445C Turbo Diesel Engine (450 HP), Mack Maxitorque ES 18-Speed Transmission, Air Brakes, Power Steering, Engine Brake, 50,000lb. GVW, Air Ride Suspension with Dump Valve, 197,249 Actual Miles, 7,167 Actual Hours, Heated & Remote Power Mirrors, Air Conditioning & Heat, AM/FM/CD Radio, Cobra 29LTD Classic CB Radio, Air Ride Seat, Flip Hood, Pinnacle Interior Trim, Muncie PTO, (2) 70-Gallon Aluminum Fuel Tanks, (1) Upright Exhaust, 11R22.5 Radial Tires, Polished Aluminum Wheels (All 12), Twin Screw Rear Ends with Air Up & Down 3rd Axle, East Model AB836 All Aluminum Dump Body-16′, Heavy Duty Hydraulic Hoist, Rear Air Gate, Rear Pintle Hitch with Rear Air & Electrical, Tall Sides. 2015 Chevrolet Silverado LT K1500 4×4 Pickup, VIN# 1GCNKREC6FZ175722, 11,232 Actual Miles, 5.3 Liter V-8 Gas Engine, Automatic Transmission, Cloth Interior, Power Windows & Locks, AM/FM/CD/Bluetooth, Rear Backup Camera, Backup Sensors, Air Conditioning & Heat, Automatic Lights, Power Mirrors, Power Driver Seat, Trailer Tow Package, Chrome Bumper, 265/65R18 Goodyear Radial Tires, Chrome Nerf Bars, Weatherguard Aluminum Tool Box, Truck Bed Mat. 2005 GMC Sierra C-1500 2WD Pickup, VIN# 1GTEC14X45Z136158, 4.3 Liter V-6 Gas Engine, Automatic Transmission, Standard Cab, 8′ Box, Air Conditioning & Heat, AM/FM Radio, 151,965 Miles, Like New 245/70R17 Radial Tires, Heavy Duty Steel Ladder Rack. 2016 Timpte “Super Hopper” Tandem Axle 42′ All Aluminum Super Hopper Grain Trailer, VIN# 1TDH42220GB152683, 65,000lb. GVW, Air Ride Suspension, 11R22.5 Radial Tires, 66″ Sides, Overall Height 10’4″, Divided High-Flow Tub, Polished Aluminum Wheels (All 8), Shur-Lok Roll Over Tarp System (Excellent Condition) (Unit 136A). 2016 Timpte “Super Hopper” Tandem Axle 42′ All Aluminum Super Hopper Grain Trailer, VIN# 1TDH42222GB152684, 65,000lb. GVW, Air Ride Suspension, 11R22.5 Radial Tires, 66″ Sides, Overall Height 10’4″, Divided High-Flow Tub, Polished Aluminum Wheels (All 8), Shur-Lok Roll Over Tarp System (Excellent Condition) (Unit 137A). 2016 Timpte “Super Hopper” Tandem Axle 42′ All Aluminum Super Hopper Grain Trailer, VIN# 1TDH42224GB152685, 65,000lb. GVW, Air Ride Suspension, 11R22.5 Radial Tires, 66″ Sides, Overall Height 10’4″, Divided High-Flow Tub, Polished Aluminum Wheels (All 8), Shur-Lok Roll Over Tarp System (Excellent Condition) (Unit 138A). 2016 Timpte “Super Hopper” Tandem Axle 42′ All Aluminum Super Hopper Grain Trailer, VIN# 1TDH42226GB152686, 65,000lb. GVW, Air Ride Suspension, 11R22.5 Radial Tires, 66″ Sides, Overall Height 10’4″, Divided High-Flow Tub, Polished Aluminum Wheels (All 8), Shur-Lok Roll Over Tarp System (Excellent Condition) (Unit 139A). 2014 Timpte “Super Hopper” Tandem Axle 42′ All Aluminum Super Hopper Grain Trailer, VIN# 1TDH42229EB140609, 65,000lb. GVW, Air Ride Suspension, 11R22.5 Radial Tires, 66″ Sides, Overall Height 10’4″, Divided High-Flow Tub, Polished Aluminum Wheels (All 8), Shur-Lok Roll Over Tarp System (Excellent Condition) (Unit 132A). 2014 Timpte “Super Hopper” Tandem Axle 42′ All Aluminum Super Hopper Grain Trailer, VIN# 1TDH42225EB140610, 65,000lb. GVW, Air Ride Suspension, 11R22.5 Radial Tires, 66″ Sides, Overall Height 10’4″, Divided High-Flow Tub, Polished Aluminum Wheels (All 8), Shur-Lok Roll Over Tarp System (Excellent Condition). (Unit 133A). 2014 Timpte “Super Hopper” Tandem Axle 42′ All Aluminum Super Hopper Grain Trailer, VIN# 1TDH42223EB142355, 65,000lb. GVW, Air Ride Suspension, 11R22.5 Radial Tires, 66″ Sides, Overall Height 10’4″, Divided High-Flow Tub, Polished Aluminum Wheels (All 8), Shur-Lok Roll Over Tarp System (Excellent Condition) (Unit 134A). 2014 Timpte “Super Hopper” Tandem Axle 42′ All Aluminum Super Hopper Grain Trailer, VIN# 1TDH42225EB142356, 65,000lb. GVW, Air Ride Suspension, 11R22.5 Radial Tires, 66″ Sides, Overall Height 10’4″, Divided High-Flow Tub, Polished Aluminum Wheels (All 8), Shur-Lok Roll Over Tarp System (Excellent Condition) (Unit 135A). 2011 Timpte “Super Hopper” Tandem Axle 42′ All Aluminum Super Hopper Grain Trailer, VIN# 1TDH42220BB129977, 65,000lb. GVW, Air Ride Suspension, 11R22.5 Radial Tires, 66″ Sides, Overall Height 10’4″, Divided Tub, Polished Aluminum Wheels (All 8), Shur-Lok Roll Over Tarp System (Excellent Condition) (Unit 128A). 2011 Timpte “Super Hopper” Tandem Axle 42′ All Aluminum Super Hopper Grain Trailer, VIN# 1TDH42222BB129978, 65,000lb. GVW, Air Ride Suspension, 11R22.5 Radial Tires, 66″ Sides, Overall Height 10’4″, Divided Tub, Polished Aluminum Wheels (All 8), Shur-Lok Roll Over Tarp System (Excellent Condition) (Unit 129A). 2010 Timpte “Super Hopper” Tandem Axle 42′ All Aluminum Super Hopper Grain Trailer, VIN# 1TDH42227AB125133, 65,000lb. GVW, Air Ride Suspension, 11R22.5 Radial Tires, 66″ Sides, Overall Height 10’4″, Divided Tub, Polished Aluminum Wheels (All 8), Shur-Lok Roll Over Tarp System (Excellent Condition) (Unit 126A). 2010 Timpte “Super Hopper” Tandem Axle 42′ All Aluminum Super Hopper Grain Trailer, VIN# 1TDH42229AB125134, 65,000lb. GVW, Air Ride Suspension, 11R22.5 Radial Tires, 66″ Sides, Overall Height 10’4″, Divided Tub, Polished Aluminum Wheels (All 8), Shur-Lok Roll Over Tarp System (Excellent Condition) (Unit 127A). 2010 Timpte “Super Hopper” Tandem Axle 42′ All Aluminum Super Hopper Grain Trailer, VIN# 1TDH42224AB122500, 65,000lb. GVW, Air Ride Suspension, 11R22.5 Radial Tires, 66″ Sides, Overall Height 10’4″, Divided Tub, Polished Aluminum Wheels (All 8), Shur-Lok Roll Over Tarp System (Excellent Condition) (Unit 117A). 2010 Timpte “Super Hopper” Tandem Axle 42′ All Aluminum Super Hopper Grain Trailer, VIN# 1TDH42226AB122501, 65,000lb. GVW, Air Ride Suspension, 11R22.5 Radial Tires, 66″ Sides, Overall Height 10’4″, Divided Tub, Polished Aluminum Wheels (All 8), Shur-Lok Roll Over Tarp System (Excellent Condition) (Unit 118A). 2010 Timpte “Super Hopper” Tandem Axle 42′ All Aluminum Super Hopper Grain Trailer, VIN# 1TDH42227AB123155, 65,000lb. GVW, Air Ride Suspension, 11R22.5 Radial Tires, 66″ Sides, Overall Height 10’4″, Divided Tub, Polished Aluminum Wheels (All 8), Shur-Lok Roll Over Tarp System (Excellent Condition) (Unit 119A). 2010 Timpte “Super Hopper” Tandem Axle 42′ All Aluminum Super Hopper Grain Trailer, VIN# 1TDH42228AB123147, 65,000lb. GVW, Air Ride Suspension, 11R22.5 Radial Tires, 66″ Sides, Overall Height 10’4″, Divided Tub, Polished Aluminum Wheels (All 8), Shur-Lok Roll Over Tarp System (Excellent Condition) (Unit 120A). 2010 Timpte “Super Hopper” Tandem Axle 42′ All Aluminum Super Hopper Grain Trailer, VIN# 1TDH4222XAB123148, 65,000lb. GVW, Air Ride Suspension, 11R22.5 Radial Tires, 66″ Sides, Overall Height 10’4″, Divided Tub, Polished Aluminum Wheels (All 8), Shur-Lok Roll Over Tarp System (Excellent Condition) (Unit 121A). 2010 Timpte “Super Hopper” Tandem Axle 42′ All Aluminum Super Hopper Grain Trailer, VIN# 1TDH42221AB123149, 65,000lb. GVW, Air Ride Suspension, 11R22.5 Radial Tires, 66″ Sides, Overall Height 10’4″, Divided Tub, Polished Aluminum Wheels (All 8), Shur-Lok Roll Over Tarp System (Excellent Condition) (Unit 122A). 1996 Bar-Bel Model 103SM Tandem Axle Stainless Steel Tanker Trailer, VIN# 4BUFGE1BXTB965925, 65,000lb. GVW, 7,000 Gallon Capacity, Air Ride Suspension, 275 80R22.5 Radial Tires, Polished Aluminum Wheels (All 8), Top Fill, (3) Compartment, Top Catwalk (Unit 131A). 2003 Walker Tandem Axle Food Grade Stainless Steel Tanker Trailer, VIN# 5WSAB46233N035485, 68,000lb. GVW, 7,500 Gallon Capacity, Single Compartment, Air Ride Suspension, Polished Aluminum Wheels (All 8), Small Top Side Catwalk, Top Fill, 295 75R22.5 Radial Tires (Unit 130A). 1978 Kari-Kool Tandem Axle Stainless Steel Tanker Trailer, VIN# CTK7124, 51,200lb. GVW, 7,000 Gallon Capacity, Spring Suspension, 295 75R22.5 Radial Tires, Polished Aluminum Wheels (Unit 115A). 2005 Hawkmaster Model ITM Triple Axle Aluminum Pup Trailer, VIN3 1Z9DA143X5C010038, 43,500lb. GVW, Air Ride Suspension, 385 65R22.5 Radial Super Single Tires, Extra Long Hitch, Polished Aluminum Wheels, Hydraulic Dump Body. 2000 Ledwell 53′ Tandem Axle Step Deck Equipment Trailer, VIN# 1L9GA72A6YL033292, 30′ Main Deck, 10′ Upper Deck, 13′ Folding Hydraulic Beavertail, Hydraulic Winch, Hydraulic Tilt Deck, Air Ride, 255 70R22.5 Low Pro Radial Tires. 1991 Case 821 Articulated Wheel Loader, SN# JAK0024006, Case 6-Cylinder Turbo Diesel Engine, Hydrostat Transmission, EROPS Cab with Air Conditioning & Heat, AM/FM/Cassette, 23.5R25 Radial Tires, 3,469 Hours on Tach, 9′ Bucket with Teeth & Joystick Control, Auxiliary Hydraulics, Hydraulic Quick Tatch, (4) Heavy Duty Rear Weights. Ford Model 8770 MFWD Diesel Tractor, SN# , 6-Cylinder Turbo Diesel Engine, Power Shift Transmission, 3,971 Actual Hours, Air Conditioning & Heat, AM/FM Radio, Tilt Steering Wheel, 3-Point with Dual Lift Assist Cylinders, (4) Hydraulic Remotes, 1000 RPM PTO Shaft, Like New 18.4R46 Rear Radial Tires, Outside Wheel Weights, 14.9R30 Radial Front Tires, Front Fenders, Front Weight Bracket & (22) Front Weights, 10-Bolt Radial Hub Duals. John Deere 3020 Diesel Tractor, SN# T113R102376, Diesel Engine, Synchro Range Transmission, Narrow Front, 3-Point, PTO, (1) Hydraulic Remote, Like New 15.5-38 Rear Tires, 6.00-16 Front Tires, 0360 Hours on Tach (Possibly 10,360). Frontier Model RC2072 3-Point Shredder, SN# 1XFRC20XKJ0121801, 72″ Width, PTO Drive, Rear Gauge Wheel (Excellent Condition). Command Model DS10EC Pull-Type Box Scraper Blade, SN# 03953985. 6′ 3-Point Shredder Attachment, PTO Drive, Rear Gauge Wheel. New Holland Model L555 Skidloader, 4-Cylinder Diesel Engine, OROPS Cab, Like New 10-16.5 Tires, 6,201 Hours, 60″ Bucket with Teeth. Pallet Fork Attachment for Skidloaders. Caterpillar Model GC25 LP Gas Forklift, 5,000lb. 189″ 3-Stage Mast with Sideshift, 9,146 Hours, SN# 4EM02239, OROPS with Roll Bar, 21x7x15 Solid Tires. Set of Fork Extensions for Forklift. Batco Model 1545TD Hydraulic Drive Belt Conveyor, SN# 157829, 15″ Wide Belt, 45′ Long, Hydraulic Lift 2-Wheel Moving Dolly. Batco Model 1314 Hydraulic Drive Truck Hopper Unload Conveyor, SN# 42053. Single Axle Utility Garden Trailer, 5’w x 6’l. GMC 5500 Single Axle Fuel Truck, VIN# CE503-Y191633, 24,000lb. GVW, V-8 Gas Engine, 4 & 2 Transmission, PTO, Hydraulic Brakes, Steel 3-Compartment Tanker Body with Tokin Pump, Auto Reel Hose Reel, 9:00-20 Radial Tires (NO TITLE – Parts Truck ONLY). Todco 22′ Aluminum Van Body, Side Door & Rear Roll Up Door. Landa Model ENG4-30024B-LP Commercial Stationary Steamer Pressure Washer, SN# 11098450-000016, 3000psi, 3.9 Gallon/Minute, LP Gas Fired, Hose, Spray Wand on Heavy Duty Stand. Alkota Model 112 Industrial Cabinet Style Parts Washer, SN# CN2119, 26″ Turn Table Diameter, 40″ Working Height, 500lb Turntable Load, 50-Gallon Wash Tank Capacity, 3HP Single Phase Electric Motor. Miller Spectrum 875 DC Plasma Cutting System with Leads & Gun on Heavy Duty Steel Cart. Miller Dialarc 250 AC/DC Welding Power Source with Leads on Heavy Duty Steel Stand. Miller Model CP-250TS Constant Potential DC Welder on Cart with Miller Millermatic Wire Feed Attachment, (2) Tanks, Compressed Argon & Gas, Leads, Tweco Gun & Miller Spoolmatic 30A Aluminum Spool Gun. CT 3-Ton Heavy Duty A-Frame Shop Hoist with Dayton 1/2HP Electric Motor on Heavy Duty Casters. Custom Built Heavy Duty Shop Press, 7.5HP Electric Motor, 2,500lb. Capacity. 9-Compartment Fluid Dispenser Station with Poly Tanks-Oil, Hydraulic Fluid, Transmission Fluid, Dextron, Washer Fluid, Anti-Freezer, Arctic Hydraulic Fluid. Large & Medium Size Acetylene Torch Sets with Smith Gauges, Leads & Gun on Heavy Duty 2-Wheel Cart. Wellsaw Model 8 Heavy Duty Steel Band Saw, SN# 21252, Auto Stop, 1HP Electric Motor. Booster-Pac Model ES1224 Truck Pac Portable Truck Jump Starter Pack, 3000 Peak Amps @ 12 Volts, 1500 Peak Amps @ 24 Volt with Charger. (2) Emerson Model 220 Barrel Type Hydraulic Floor Jacks, 22-Ton Capacity; Walker 4-Ton & 10-Ton Long Frame Hydraulic Floor Jacks; Emerson Model 25 Hydraulic Low-Profile Floor Jack; Brownie 10′ Rolling Warehouse Ladder, 300lb. Capacity; 5-Gallon Air Bead Seater; (2) Pair of 12-Ton Jack Stands; (2) Pair of Walker 10-Ton Jack Stands; (1) Pair of Norco 10-Ton High Rise Jack Stands; Craftsman 6″ Bench Grinder, 1/3HP; Sears Craftsman 10″ Drill Press, 1/2HP, 4-Speed, 1/2″ Chuck; Craftsman 8″ Bench Grinder, 1.0HP; Several Vise Grip Bar Clamps; First Aid Kits; Maxx Air High Velocity 42″ Fan on Wheels; Associated Model 6006 Fleet Battery Charger/Starter (Excellent Condition); SkilSaw with 2.5HP Motor; Craftsman Skil Saw; Makita Model 2414 Portable Cut-Off Saw; Schumacher SE 8050 Battery Charger Jump Pack, 300 Amp; Associated 300 Amp Battery Charger/Jump Pack; Norco Model 78106 3-Ton Cherry Picker/Engine Hoist; Featherlite 6′ Fiberglass Step Ladder; Snap-On 9-Drawer Rolling Tool Box; (5) 30-Ton Air/Hydraulic Bottle Jacks; 3-Step Warehouse Ladder; 2-Wheel Cart; Homelite Gas Chain Saw; Large Selection of Electric Motors & Starters; Log Chains; Chain Binders; Master 300,000 BTU Shop Heater; Hand Probes; Hydraulic Pumps; 10-Ton Hydraulic Porta Power with Steel Tool Box; Norco Model 7240A Brake Drum Handler Cart; Heat Buster Model TCP4213 Electric Shop Fan, 42″; Snap-On Hydraulic Transmission Jack; Walker Hydraulic Transmission Jack; (2) New Zeematic Model 610 Pistol-Type Grease Guns; Professional Service 1/0 Gauge Booster Cabinets with Hard Sided Case; Set of John Deere Sway Blocks; Norco 22-Ton Air/Hydraulic Floor Jack; Steel Tire Explosion Cage; Walker Hydraulic Dual Wheel Tire Jack; Large Assortment of Heavy Duty Log Chains & Chain Binders; Heavy Duty Safety Clevises; American Forge & Foundry Model 4008 1.5 Ton Ratchet Hoist. Lots of Misc Tire Tools & Tire Hammers; Several Sets of Wheel Chalks; 26″ Ridgid Pipe Wrench; Hand Tools Including Hammers, Pliers, Wrenches, etc; Central-Pneumatic Heavy Duty 1″ Drive Reversible Long Ram Air Impact; (3) Ingersoll-Rand 3/4″ Drive Reversible Long Ram Air Impacts; (2) Ingersoll-Rand & (2) Snap-On 3/4″ Drive Air Impacts; Central-Pneumatic 1″ Drive Air Impacts; Several Heavy Duty Pullers; Large Assortment of 3/4″ & 1″ Wright Impact Sockets; Star Tire Wrench; Boa Model 308i Mig Bore Repair System with Heavy Duty Aluminum Case & Dies; Ridgid Pipe Clamps; Antique Draw Knife; (2) Ridgid Tap & Die Sets with Wood Holders; Old Letter Punch Set with Wood Case; Miktoa Electric Sawsall; Stanley Electric Stapler; Misc Puller Sets; Large Piston Ring Clamps; Ridgid Hand Pipe Threader with Ridgid Pipe Cutter; Milwaukee Whole Saws; Puller Sets; K-D Tools 4-Piece Precision Pilot Reamer Set with Case; K-D Tools 7-Piece Precision Pilot Reamer Set with Double Taper; Snap-On & Ingersoll Rand 1″ Drive Long Ram Air Impacts; Napa 4-Ton Hydraulic Porta Power. Snap-On 5-Drawer Steel Locking Shop Cabinet on Wheels with Snap-On Pro Link Ultra & Snap-On Pro Link iQ Engine Analyzers with Cases, Asus HDMI Computer Monitor in Top of Cabinet, Lenovo Hand-Held Wireless Keyboard & LexMark Model MS310d Computer Printer. Snap-On “Kool-Kare” Portable Freeon Recharge & Recovery Cart for R134A, Digital Readout, Gauges. Gates Model PC707 Hydraulic Hose Crimping Machine, 700 Series Dies, Digital Readout, Hydraulic Power Unit & Inventory. OTC Model 5077A Electric Powered Motor Transfer Tanker; Snap-On F-134A Freeon Tester; Snap-On Combination Puller Set with Wall Display; Snap-On Model VR200BM Electric Bench Top Valve Replacer, SN# 5692; OTC Model 5018 Hydraulic Clutch Handler; OTC No 7155 Fuel Injector Nozzle Puller Set for Mack Engines; Heli Coil No 5522 Master Thread Repair Set with Case; Atco Model 3700 Hose Crimper Set with Case; Mack Tools Transmission/Oil Test Kit with Case. Bridgeport Model J Industrial Vertical Mill, SN# J31176, 1HP Electric Motor, Heavy Duty Bridgeport Vise, 4′ Floating Table with XYZ Axis. LeBlond Regal Gap Bed Lathe, 3-Jaw Chuck, Tool Rest, Tooling; Sheldon Machine Co No 3 Hand Type Arbor Press; Clamp Set for Bridgeport Lathe. Assortment of Cold Rolled Steel; Cast Aluminum & Steel Tubing; Assortment of Steel Tubing, Angle Iron & Flat Steel on Heavy Duty Island Style Steel Rack. Torch Parts, PTO Shafts, Knuckle Parts; Assortment of New Trailer Leaf Spring Sets; Approx. (120) New Mud Flaps; Car Quest Fan Belt Assortment; Truck Mounted Hose Reel; New Truck Fenders; Several Flare Kits; New Bloom Model 10-0-18-8 Winch; Mirror Brackets & Mirrors; Aluminum Quarter Fenders; Several Front Hood Skirts; Aluminum Fuel & Hydraulic Fluid Tanks; Several Parts for Wet Kits; New 120-Gallon Aluminum Fuel Tank; Large Assortment of New Bolts; New Suspension Parts; New Clamps of Various Sizes; New Tail Light Assemblies; Large Selection of U-Bolts for Drive Shafts & Exhausts; Up to 4″ Flex Exhaust Tubing; Hydraulic Cylinders; Large Selection of Parts for Trailer Jacks; Suspension Shocks; (5) Flex Air Hoses (New); (2) Haldex Remanned Air Dryers (New); (3) Cases of Diesel Treat; Several Pickup Tool Boxes; Weatherguard Locking Top Mount Tool Box; Large Assortment of Donaldson Fuel & Oil Filters; Several Truck Seats-Some Air Ride; Large Assortment of Roll Over Tarp Parts-Tarps, Hand Cranks, etc; Ratchet Tie Downs for Semi Trailers; Brand New Windshield Glass for Trucks; Truck Fenders; Electrical Boxes; Exhaust Parts-Uprights, Extensions, Protectors, etc; Napa 4-Drawer Total Circuit Protection Assortment; Carrand O-Ring Repair Service Kit; New Mack Air Ride Suspension Canisters; Large Selection of Hydraulic Steel & Brass Pipe Fittings (Connectors, Elbows, T’s, Caps, Couplers); New Federal Mogul Oil Seals; Timcon Tapered Roller Bearings; Chelsea PTO Hydraulic Parts; Drive Line Shaft; Rebuilt Radiator; Cummins Engine Parts; Electrical Parts, Switches, Connections & Fuses; Large Selection of Spicer Drive Train Components; (2) New Air Brake Canisters; Large Selection of Baldwin Oil Filters; (3) Delco Remy Starters (New); New Brake Pads; Large Selection of Radiator & Other Hose; Air Brake Air Suspension Canisters; (7) Boxes of New Coolant Hose; Rocker Shafts; (2) Sets of New Road Choice 3 in 1 Air Power Line Sets-12′ Long; Several Cobra 29LTD Classic CB Radios; Tons of Mack Engine & Truck Parts – Huge Selection; New Wiper Blades. New Tires: Firestone 295/75R22.5 Radial Tire, Continental 295/70R22.5 Radial Tire on Rim, Bridgestone 255/70R22.5 Radial Tire on Rim, (10) Firestone 11R22.4 Radial 14-Ply Tires, (4) General 11R22.5 Radial Tires, (2) Continental 11R22.5 Radial Tires, (6) Dayton 11R22.5 Radial Steering Tires, (8) Dayton 11R22.5 Radial Steering Tires, (4) Firestone 11R22.5 14-Ply Radial Tires; (9) Used 11R22.5 Radial Tires. (5) Accu-Ride 22.5×8.25 Aluminum Truck Wheels (NIB). (4) Sections of SK200 Heavy Duty Pallet Racking, 10′ wide Sections, 8′ Tall Uprights, (2) Shelves Each; (2) Niehoff Steel Parts Cabinets; 40 & 70-Bin Tif Co Metal Bin Assortments with Contents; (2) Metal Wall Mounted Parts Cabinets; 4-Reel Heavy Duty Hose Reel Stand; Several Heavy Duty Shop Carts & Stands; Steel Shop Foreman’s Desk with Center Drawer; Heavy Duty Freight Cart; Large 2-Door Locking Storage Cabinet; (3) 4-Drawer Parts Bins with Inventory; (2) 72-Bin Steel Bolt Cabinets with New Inventory; 36-Bin Steel Bolt Cabinet with New Inventory; Hi-Line, Curtis & (2) Tif Co 4-Drawer Parts Cabinets; Durham 6-Drawer Parts Cabinet; (2) Heavy Duty 2-Door Locking Steel Storage Cabinets; Several Heavy Duty Steel Shelf Units; (2) Sears Craftsman Professional 2-Door Locking Flammable Cabinets; (2) Heavy Duty Steel Welding & Shop Benches with 8″ Heavy Duty Vises. Zep Dyna 143 Parts Washer Degreaser-New 50 Gallon Drum; 50-Gallon Drum of Final Charge Global 50/50; (2) 50-Gallon Drums of Polar Antifreeze + Coolant; 50-Gallon Drum of Peak 50/50 Pre-diluted Antifreeze & Coolant. Metal Wheel Barrow; Antique Steamer Trunk; Large Assortment of Cleaning Supplies, Paint, Silicone Caulk, Lubricant, Hand Soap & Etc; Various Size Kidde Fire Extinguishers; Large Ratchet Straps; Huge Assortment of Aluminum Hanging Brackets; Several Large Electric Motors-Up to 50HP. 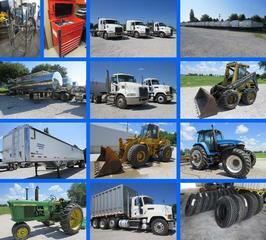 Make your plans now to attend this Complete Retirement Dispersal Auction. Connie has made the decision to retire and is offering all of her SUPER Clean & very well cared for Equipment for you to buy at your price at Absolute Public Auction! This is only a Partial List for Complete Listing & Hundreds of Photos visit www.nitzauctions.com. Previous Inspection Thursday, September 13, 2018 1:00 – 5:00 PM and Auction Day Only Please. Lunch & Restrooms on Grounds.